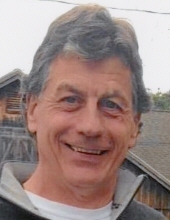 Glenn Robinson Simmons, 56, of Maynard, formerly of Concord, passed suddenly on Saturday, January 26, 2019. Glenn was a graduate of Concord Carlisle High School’s class of 1980, and the Rochester, NY Institute of Technology in 1984. He was an Industrial Designer who redesigned the first Dunkin Donuts in Quincy, MA. He also designed the new gift shop at Boston Children’s Hospital, where he spent some of his childhood as a patient. He joined the family business, Specialized Plastics, Inc. in 2003 as the Design and Product Development Director. Glenn was also a die-hard supporter of all local sports teams, attending as many games with his children as possible. His interests included art, music, sports, and his family. He was the cherished son of Beverly Robinson (Miller) Simmons of Acton and the late Warren Arthur Simmons who died in 2010, both of whom are originally from Belmont and Concord. He was the dearly loved father of Haley Jean Simmons and Benjamin J. Simmons, both of Maynard, and the beloved brother of Jeffrey A. Simmons and his wife Andrea of Littleton, and the late Andrew M. Simmons who died in 2016. He is also survived by many nieces and nephews including Nicholas, Christopher, and Taylor Simmons of Littleton and Jacquelyn and Meghan Simmons of Ayer, as well as several cousins. Family and friends will gather for visiting hours on Monday, February 4th from 4 to 8 pm in the Dee Funeral Home, 27 Bedford Street, Concord Center. A private funeral service will be held the following day, followed by burial alongside his father and brother at Sleepy Hollow Cemetery. In lieu of flowers, contributions in his memory may be made to Boston Children’s Hospital, 401 Park Drive, Suite 602, Boston, MA 02215. "Email Address" would like to share the life celebration of Glenn Robinson Simmons. Click on the "link" to go to share a favorite memory or leave a condolence message for the family.